Tue, Apr 9, 2019, 09:20 am SL Time, ColomboPage News Desk, Sri Lanka. Apr 09, Colombo: The latest edition of the World Banks report "South Asia Economic Focus, Exports Wanted" says Sri Lanka is facing a challenging macroeconomic situation and the challenging political environment remains a key source of risk. 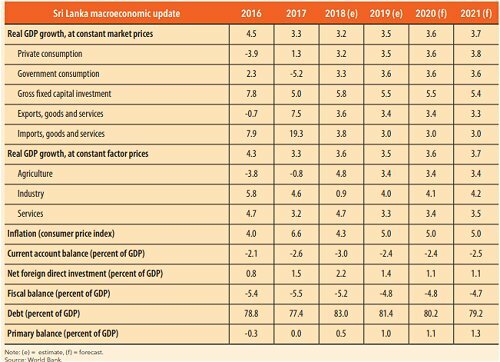 According to the World Bank's twice-a-year regional economic update, Sri Lanka's Growth declined to 3.2 percent in 2018, and the fiscal deficit was 5.2 percent of GDP while external sector performance remained weak with a widened current account deficit and low reserves. The growth dampened significantly in 2018, partly due to political tensions which impacted international business confidence. Leading rating agencies revised their assessments and Fitch, S&P, and Moody's downgraded Sri Lanka's sovereign ratings. The, political uncertainty last year led to foreign selling and stock prices declined from March until October of last year. The export growth decreased from 7.5 percent in 2017 to 2.1 percent in the fourth quarter of last year. At the same time, however, import growth came down from nearly 20 percent in 2017 to -5.8 percent in the last quarter of last year. While export shares in South Asia are below the world average Sri Lanka exports more services as percent of GDP than the world average. In South Asia Bangladesh, Sri Lanka and India are nearly at potential regarding their exports to the United States and the EU but have considerable gaps with China and the rest of the world. The World Bank update points out that while the world average off goods exports is 22 percent, it is only around 13 percent in Sri Lanka. 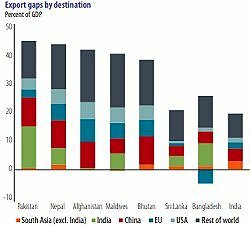 The export gaps are smaller but with around 20 percent of GDP still substantial in Sri Lanka. However, going forward, the economy is expected to rebound, and growth to converge gradually toward 4 percent in the medium term, driven by domestic demand and inflation is projected to stabilize around 5 percent. Continued fiscal consolidation, albeit slow, should bring the overall fiscal deficit and public debt on a downward path. The current account deficit is projected to remain at around 2.4 percent of GDP between 2019 and 2021, as tourism receipts help counterbalance the effect of sluggish remittance flows and high external interest payments. Foreign capital inflows to government securities and FDI should help meet external financing requirements. Poverty has remained on a downward trajectory, with the headcount ratio estimated at 8.7 percent in 2018. The recovery of domestic demand and improvements in the labor market, aided by low inflation, should boost real incomes and lead to a further reduction in poverty. As Sri Lanka is a fast-growing tourist destination, the tourism sector could help accelerate poverty reduction as it is labor-intensive, requires relatively low investment, and thus holds great potential to create jobs for youth and women, according to the report. "More generally, the recovery of domestic demand and improvements in the labor market, aided by low inflation, should boost real incomes and lead to a further reduction in poverty," it says. However, the challenging political environment remains a key source of risk according to the World Bank since given recent developments, and the impending election cycle, the window for reforms is narrowing. Large refinancing requirements make the country vulnerable to global financing conditions. On fiscal and debt management fronts, risks include a delay or reversals in efforts to strengthen revenue collection, improve tax administration, and implement liability management operations. On the external front, tighter than expected global financial conditions would increase the cost of debt and complicate endeavors to roll-over maturing Eurobonds. The report says rising in oil prices increase current account deficits in South Asia, at least in the short run and th effect is strongest for Sri Lanka. The increasing occurrence and impact of natural disasters could also have an adverse impact on growth and poverty reduction. Priority reforms to sustain economic growth, create more and better jobs, and reduce poverty include: (a) fiscal consolidation to make space for investments in health, education, social protection and public infrastructure; (b) improving competitiveness and promoting trade and FDI to facilitate a shift in the growth model driven more by private investment and exports; (c) mainstreaming governance reforms, particularly with respect to public finance management (PFM) and state owned enterprise (SOE) reforms; and (d) reducing vulnerability stemming from refinancing risks and natural disasters risks.